at the Half Price Bookstore yesterday..."Push Paper," curated by Jaime Zollars for Lark Books. I love this series of books. Each is curated by a different individual and each book explores nearly 30 contemporary artists pushing the boundaries of their craft. This is paper that is cut, layered, sculpted, installed; paper doing anything and everything. One of my favorite artists is included, Elsa Mora, who I have mentioned on this blog. Rob Ryan is also featured, and his paper cuts were the first I ever fell in love with. His works are so delicate, romantic and lovely, in both image and sentiment. 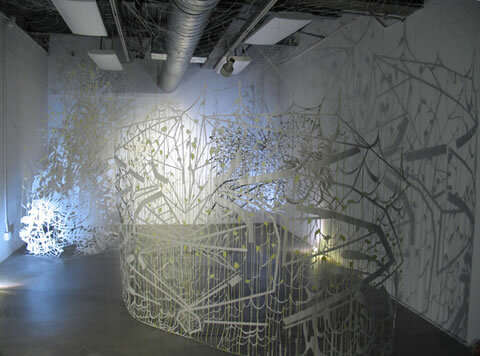 And then I discovered artist Chris Natrop's room sized cut paper installations. I can't even imagine how he conceives of these. They are beautiful and intricately cut, and all the more interesting for the shadows they cast. And once you start googling paper cut-outs and sculpture, you find so much more.